Lovely, lively Italian lessons have started in Droitwich this year. These classes are ideal for anyone who would like to get to understand and speak basic Italian. There is no need to have any prior knowledge at all as the course takes you from the very beginning. You will no have to speak in front of the class but rather enjoy being in a relaxed, sociable environment with no testing or exams to contend with. Instead each lesson is very structured and effective and will lead to greater confidence and ability to speak and really have a go. The term is ten weeks long. For dates and to enrol please contact me, Clare. I'm your tutor and licensee in Droitwich. Bonjour. Je suis Clare...je me presente un peu...I was brought up to love France – as a child we went there often with my family – but then, after several exchange visits as a teenager, I began to really love the interaction and different sounds of the French language for myself. I developed an interest in all things French. And that has carried on all through me life really. I have a French and Music degree, have lived near Paris for a year and spent another year in Toulouse as an ‘assistante’ - I have been teaching French in English schools ever since. Now I am very excited to be sharing my love of French with other adults. I know that the methodology used in Language for Fun classes means that the focus for learning is fun, interactive and great for building confidence! 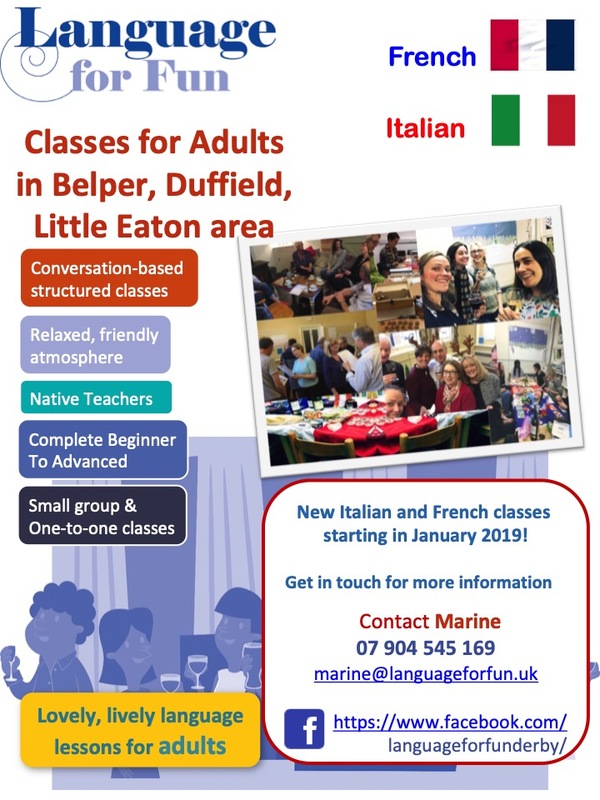 I look forward to beginning Italian as well as French with you soon – do get in touch and come along to a free lesson.